Don’t overlook Nuneaton council houses for your next buy to let investment. Do you remember the ‘Right to Buy’ scheme my Nuneaton Property Blog readers? The ‘Right to Buy’ scheme was a policy introduced by Maggie Thatcher in 1980 which gave secure council tenants the legal right to buy the Council home they were living in with huge discounts. The heyday of Council ‘Right To Buys’ was in the 80’s and 90’s, when 1,719,368 homes in the country were sold in this manner between October 1980 and April 1998. However, in 1997, Tony Blair reduced the discount available to tenants of council houses and the numbers of properties being bought under the Right to Buy declined. So what does this mean for Nuneaton homeowners and landlords? Well quite a lot in fact! Looking at the figures for our local authority, whilst the number of ‘Right to Buys’ have dwindled over the last few years to an average of only 33 ‘Right to Buy’ sales per year, one must look further back in time. Looking at the overall figures, 3,645 Council properties were bought by council tenants in the Nuneaton and Bedworth Council area between 1980 and 1998. Big numbers by any measure and even more important to the whole Nuneaton property market – every Nuneaton homeowner, Nuneaton landlord and even Nuneaton’s aspiring first time buyers – when you consider these 3,645 properties make up 6.69% of all the privately owned properties in our area, because in local authority area, there are only 54,410 privately owned properties. Nuneaton first time buyers and landlords can now buy these ex-council properties second hand – or, as the PC brigade like to call them ‘pre-loved ex–local authority dwellings’ – as those original 80’s and 90’s tenants, now homeowners, have more than passed the time of any claw back of the discount they received. Council discount was repayable if the first owner sold within a stipulated time period – usually 5 years. Now let us all be honest, some, not all, but some ex-council properties lack the vital KSA that some landlords crave. The new homes builders know all about KSA (or Kerb-Side-Appeal) as they dress up the exteriors of their new homes to make them more appealing to buyers… and if you don’t believe me, pop along to your nearest new housing development and you will see an immaculately dressed up show home! Going on the exterior looks of a modern property might be a theoretically good way of choosing a Nuneaton buy-to-let property, but in a challenging market, some Nuneaton investors are finding a more no-nonsense down to earth approach brings the largest returns. Yes, the modern stuff being built in Nuneaton is lovely- look at the Bermuda estate for example, but too many landlords purchase buy to let property solely based on where they would choose to live themselves, instead of choosing with a business head and choosing where a tenant would want to live… because remember the first rule of buy to let property … you aren’t going to live in the property yourself! What an ex-council property lack in terms of KSA, they more than make up for in other ways, such as larger rooms, larger gardens etc. Tenants are more worried about how close the property is to a particular school or how close family members may be for child care. These things matter to them far more than the look of a property. Whilst ex-council properties tend to increase in value at a slower rate than more modern properties, that is more than made up in the much higher yields – and those built between the wars or just after are really well built. Tenant demand for such properties is good since Nuneaton property values are so expensive, a lot of people can’t get mortgages to buy, so they will reconcile themselves to renting, meaning there is a good demand for that sort of property to rent. 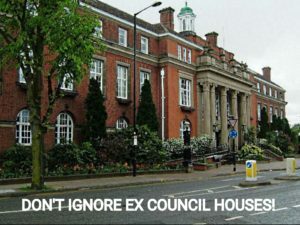 Also, the very fact the council were forced to sell these Nuneaton properties in the 80’s and 90’s, means that today’s younger generation who would have normally got a council house to live in themselves, now can’t as many were sold ten or twenty years ago. So, back to the figures… that just leaves the 5845 council houses still owned by the local authority to be sold to their tenants in the coming years! So, to Nuneaton landlords I say this … don’t dismiss ex-council houses and apartments – but remember the 1st rule of buy to let. However, those very same Nuneaton landlords should go in with their eyes open and take lots of advice. Not all ex-council properties are the same and even though they have good demand and high yields, they can also give you other headaches and issues when it comes to the running of the rental property. For further advise or if you just feel like popping in and having a chat, we are located by Nuneaton train station, on Bond Street. What does ‘Brexit’ mean for the 40,000 plus homeowners of Nuneaton?